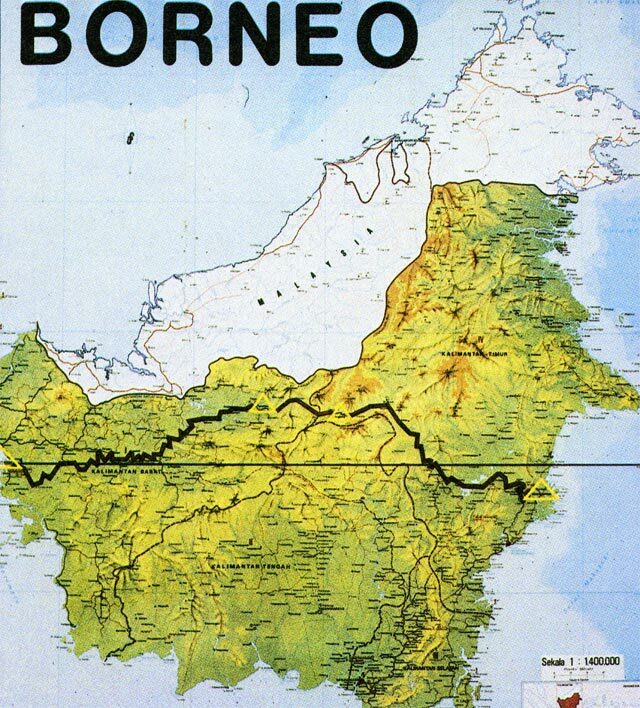 In 1986 my expedition successfully crossed Borneo along the line of the equator from Samarinda to Pontianak. 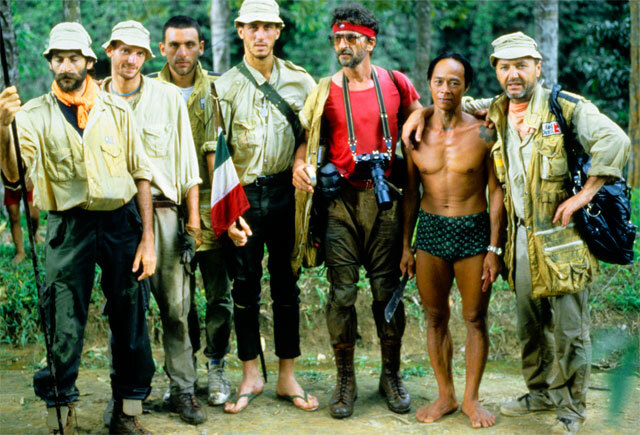 On board of canoes and by foot, six men covered 2.500 kms in 31 days of impenetrable forests bringing to end a trip never succeeded by the white man. 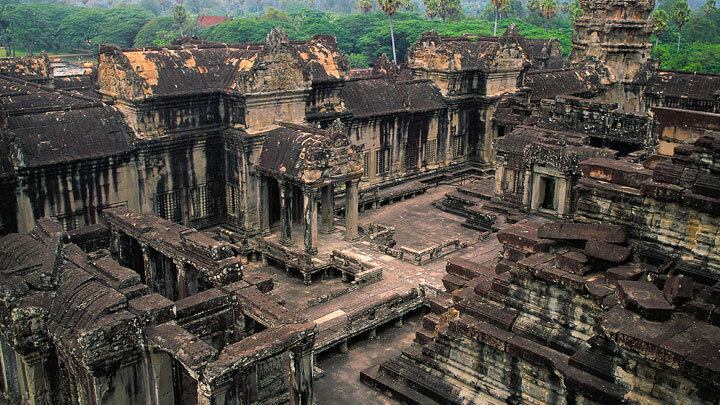 I had entered into the largest temple in the world: the jungles of Borneo. 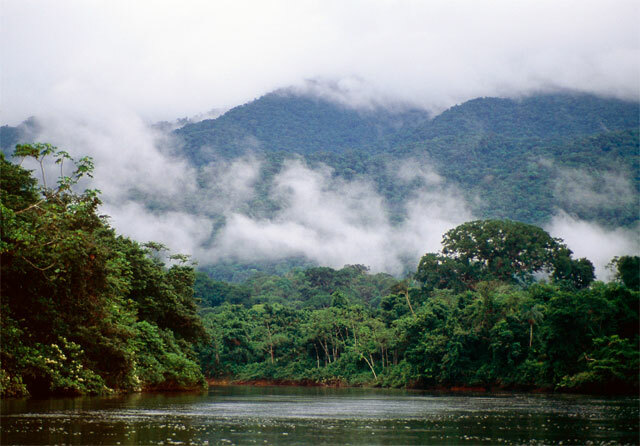 Everything was green: the plants, the sky itself, the rivers, the earth. Greens of every shade, breached every now and then by shafts of light from the cloud-filled sky and by the yellow smears of the mud-banks in the river. In the jungle man feels insignificant. There is no comparison between him and the opulence all around. The smell of rot was overpowering. 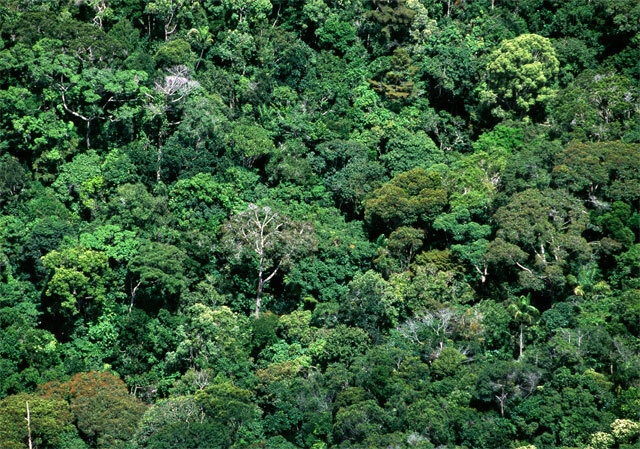 The trees live as long as their roots can grip in the mud and soft soil of the forest floor. When a tree falls, another quickly takes its place, while the humidity rapidly decomposes the trunk. Termites invade it. Giant ants build their nest there. 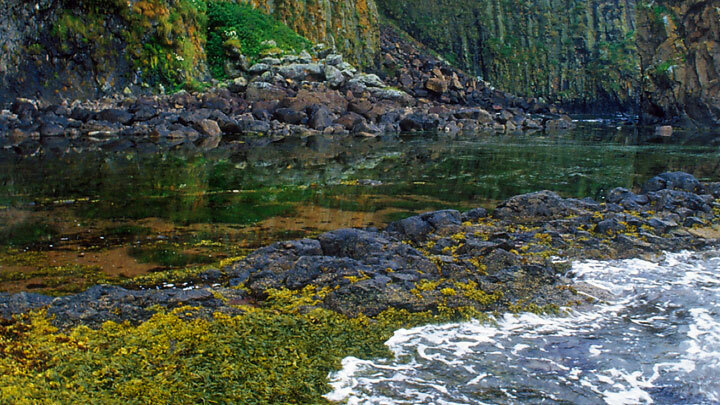 Larvae, fungus and moss live off it. Before long, it is as if the tree had never existed. 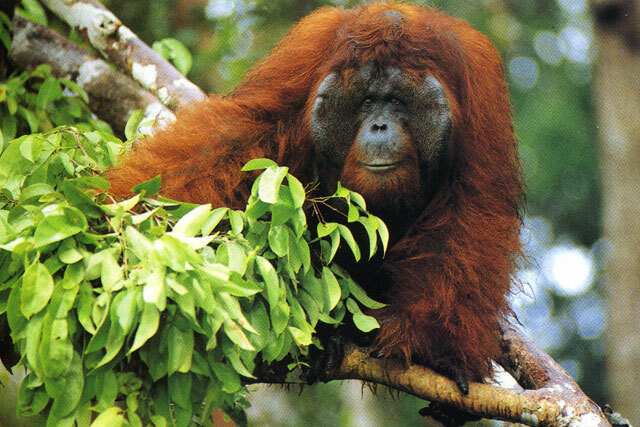 Going to Borneo had been a dream of mine for years. It became a kind of disease; everything I did had this obsession as its final goal. 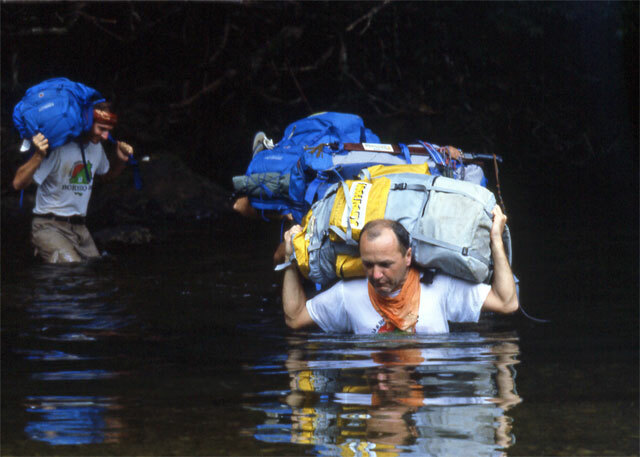 I always knew, however, I would succeed in overcoming all obstacles to organize an expedition through Borneo, from coast to coast, following the line of the Equator for 1500 miles. 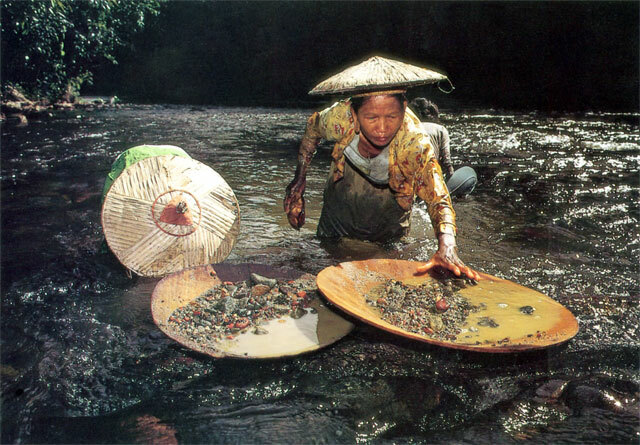 The Dayak village was on the margin of civilization in the Mahakam heights at the foot of Mount Muller. 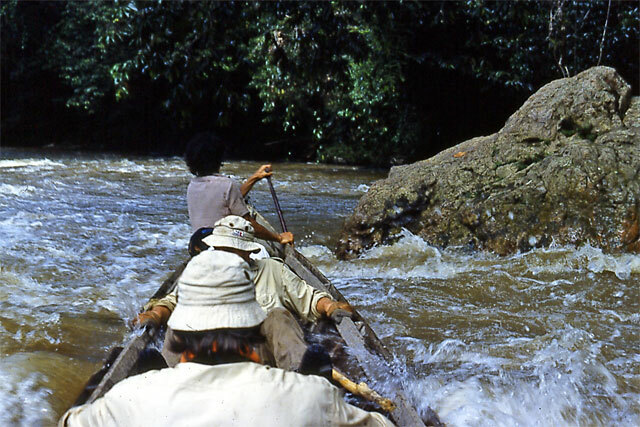 Until the river became un-navigable we had travelled in primitive boats powered by an outboard motor. Wherever there are motors progress will be found interfering in traditional ways of life. 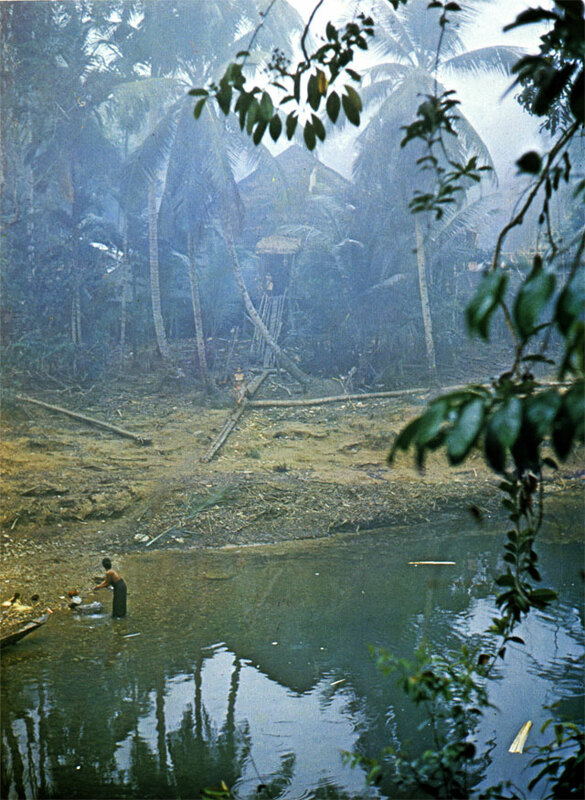 The animals are taking refuge more and more in the interior of the island while the tribesmen are moving in the opposite direction, to look for modern civilization. Here, "civilization" meant a muddy village of straw-roofed huts on the bank of the river, which is a synonym for life, food and communication. 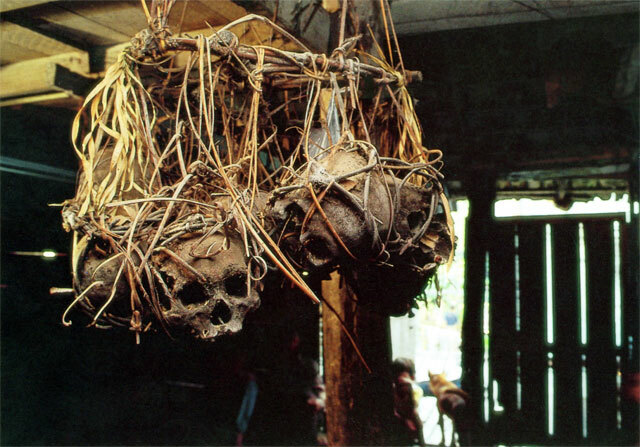 Human heads were hanging from a charred beam, with their empty eye-sockets playing host to spiders, like grapes dangling from a vine. I looked at them with pretended indifference, but my heart started pounding and the hairs of my neck began prickling like an animal at bay. 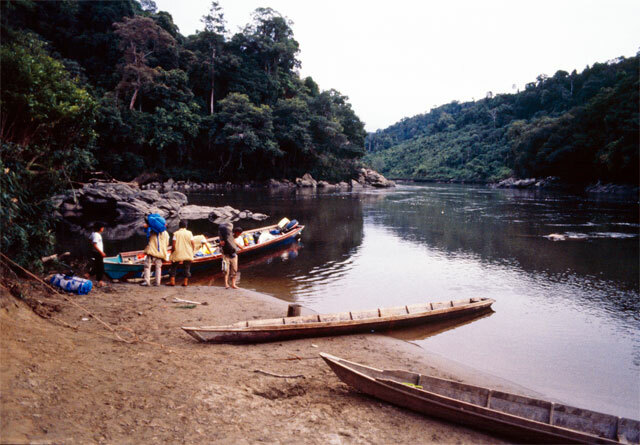 Were there still headhunters in this jungle? 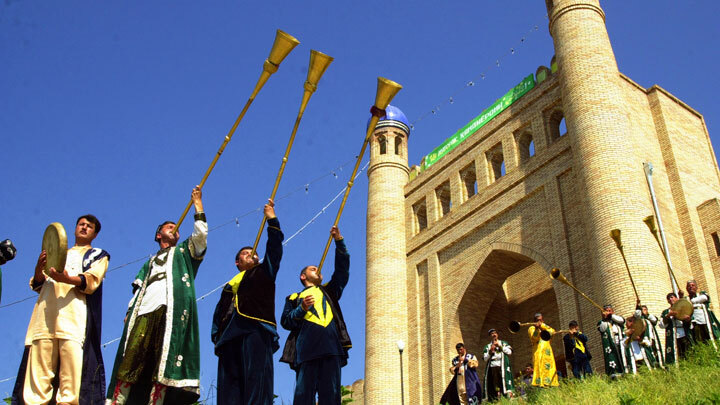 I looked at the men sitting around a huge caldron of tuac, a somewhat sour drink made from fermented rice. Their faces were impassive. The women were preparing a meal, while tirelessly chewing leaves of sin, a light drug which produces an dopey smile and reddens the teeth and gums. I was a little ashamed at not feeling any pity for the men whose heads were dangling around me, but for the moment I was too worried about my own safety. I had been assured that headhunting no longer went on, but who knew what might happen so far from the nearest city. Slowly the tension ebbed away and my companions and I began to relax a little. We had brought gifts, which the natives accepted with dignity: a little medicine, an electric torch, a mul-tri-bladed knife, fishing line and hooks. These common products of civilization are beyond price in the jungle. 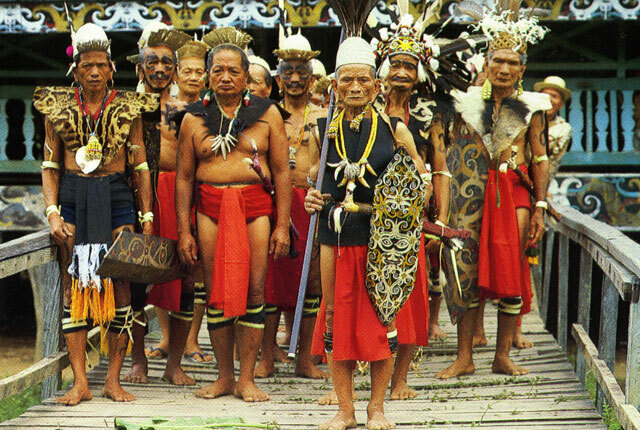 The Dayaks live as they always have done, wrapped in an aura of mystery and cruelty, while in reality, they are a people that has learnt to face the hardship of their life with mildness. There are perhaps 50,000 of them left, protected little and assisted less by the government in Jakarta. Most still insist on living in the long communal houses which are their traditional form of lodging, despite the government's efforts to persuade them, especially the young, to live in small family units. 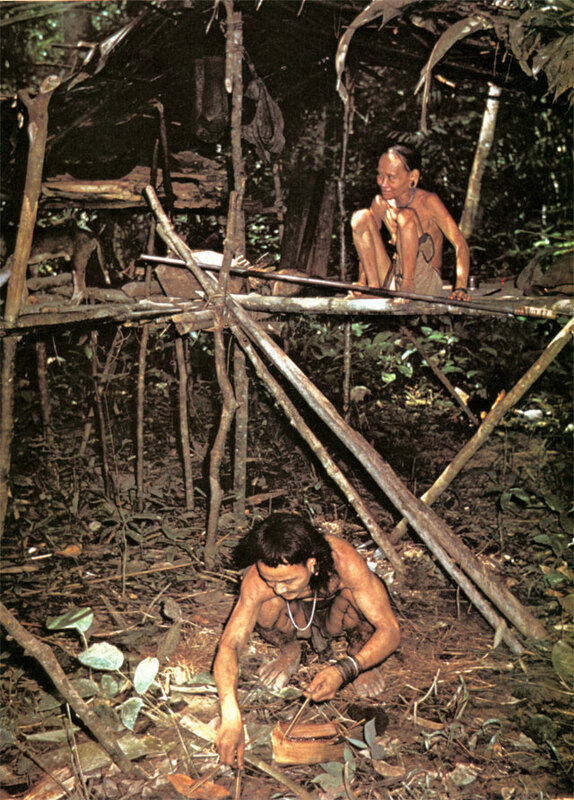 Living in small houses is fine in the city but in the forest it is more sensible for everyone to stay together. 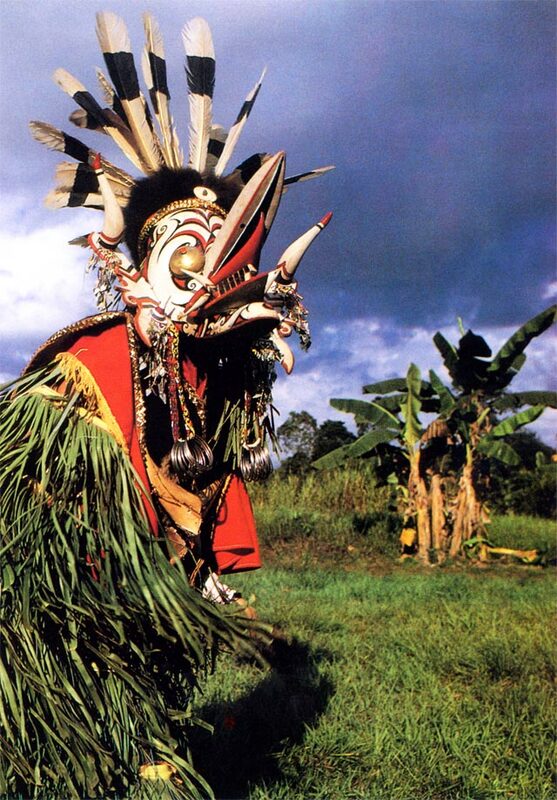 In the meantime, the last few long houses remain, wooden, thatched, resting on stilts some twelve feet from the ground with a balcony which is used as a stage for rituals and the Dayaks slow, graceful form of dancing. Inside, the long houses are pitch dark except for a flickering fire built on stones which provides a dim light by which one can see the untidy, sad and squalor-filled atmosphere within. 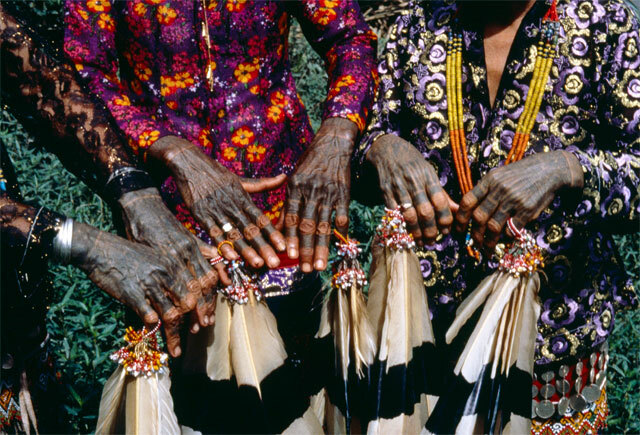 Married women, whose hands are tattooed to indicate their condition, cook the dinner and thresh the rice while holding their smaller children to their breasts. The newly-born, meanwhile, are kept "rolled up" in folds of cloth which are hung from the ceiling in bundles. 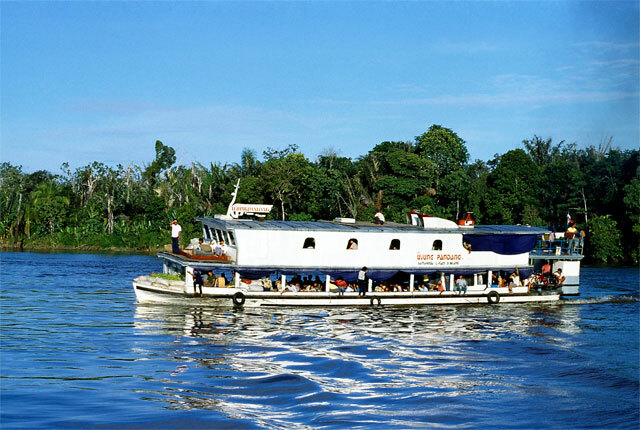 Boats are the only form of transport in this place. 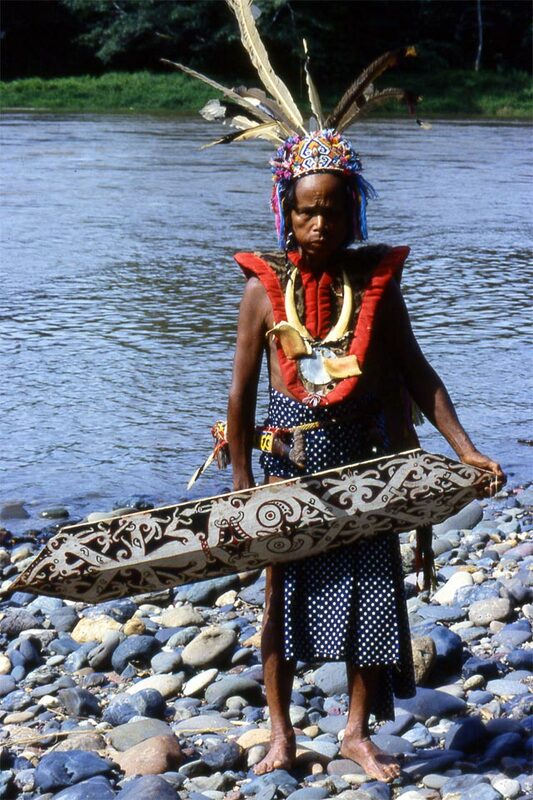 The Dayaks sail both upstream and downstream by canoe: long, light boats which are kept out of harm's way by the skill of their paddlers, who live a charmed life in the rock-bound stream of the river. The current is so fast as to make boats almost uncontrollable. Sometimes you are lucky. Sometimes not. We lost part of supplies one day when one of our boats overturned.